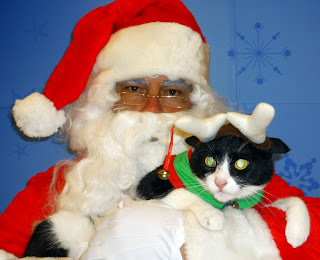 Your Daily Cute: Two Cats Wednesday: Moo Visits Santa! I think both Moo and Pimp look so cute wearing their Xmas hats! Great pics!!! What a great boy Moo was for Santa! He must have wanted to make Santa's nice list so he would get lots of presents! Such cuteness! I don't know how my monkeys would react to a visit with Santa, but I think #1 and #2 might also make an appearance! I was just wondering when we would see these, he sure did a great job, the tongue is just precious! Way to go, Moo! You are much braver than I. Did moo go all out and ask for unlimited food and pets as his Christmas present? These pics are hysterical! Impressive, Moo! Pimp will see the error of hims ways when Moo gets all the treats from Santa! 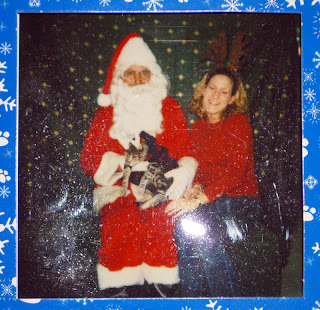 BTW, my mom wants to say to your mom that there is something so wrong about hasing a grate tan in a Santa pikshur :) I think she is jellus. Wow I am impressed that either of them has ever tolerated that - I would be seriously injured if I tried that! They are all very cute pictures. 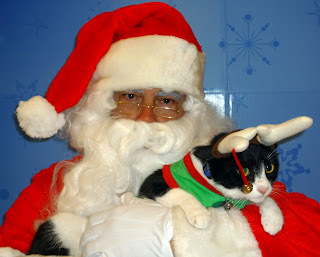 To me it appears that Pimp and Moo are not fooled by those ridiculous Men trying to look like Santa. Moo seems to be thinking, "Wait a minute! This isn't the REAL Santa Claus!" 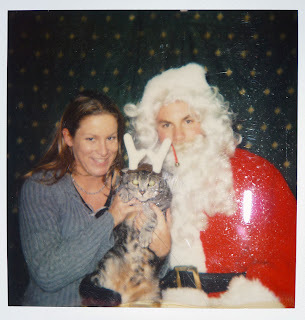 I will be doing NO Santa posing this year - I know they are all poseurs. Awww, now that was toooo cute! These are so cute! And YOU are so cute! 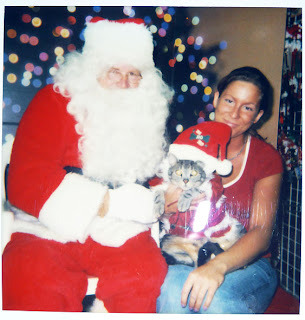 I have yet to take our cats to see Santa. I don't think they'd enjoy it much. But I would like to have one of these photos. Maybe I can just Photoshop yours our and put mine in? this isn't cute at all. gross. 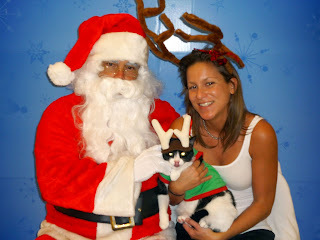 Moo is so cute visiting Santa Claws! Love seeing all the photos!